This year’s conference was an outstanding success! 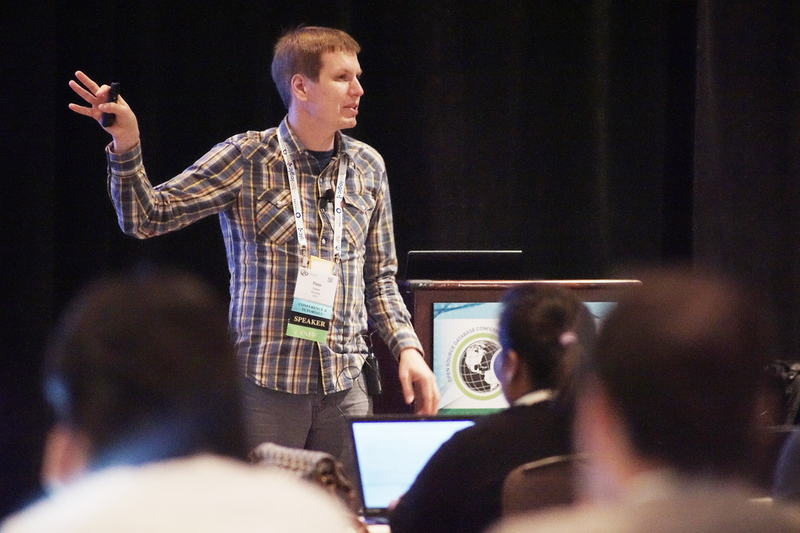 The event brought the open source database community together, with a technical emphasis on the core topics of MySQL, MariaDB, MongoDB, PostgreSQL, AWS, RocksDB, time series, monitoring and other open source database technologies. We will be posting tutorial and session presentation slides at the Percona Live site, and all of them should be available shortly. Informative tutorials on day one, including MySQL Replication, the Community Sceptic Roundup, Open Source Monitoring for MySQL and MongoDB with Grafana and Prometheus, MyRocks Deep Dive: Flash Optimized LSM Database for MySQL, and its Use Case at Facebook and Hands-On Test Drive: MySQL on Ceph. An outstanding and fun Welcome Reception sponsored by Booking.com. Excellent keynote speeches such as SQLite: The Most Important Software Component That Many People Have Never Heard Of, The Open Source Database Business Model is Under Siege, The Future Of Monitoring Is Distributed, Monitoring Booking.com without looking at MySQL and Continuent is back! But what does Continuent do Anyway? A great Networking Reception in Expo Hall, where everyone met, mingled and made merry. We would like to thank all of our valuable event sponsors, especially our diamond sponsors Continuent and VividCortex – your participation really makes the show happen. Beringei is Facebook’s open source, in-memory time series database. Justin Teller, Engineering Manager at Facebook, presented the session. According to Justin, large-scale monitoring systems cannot handle large-scale analysis in real time because the query performance is too slow. After evaluating and rejecting several disk-based and existing in-memory cache solutions, Facebook turned their attention to writing their own in-memory TSDB to power the health and performance monitoring system at Facebook. They presented “Gorilla: A Fast, Scalable, In-Memory Time Series Database (http://www.vldb.org/pvldb/vol8/p1816-teller.pdf)” at VLDB 2015. In December 2016, they open sourced the majority of that work with Beringei (https://github.com/facebookincubator/beringei). In this talk, Justin started by presenting how Facebook uses this database to serve production monitoring workloads at Facebook, with an overview of how they use it as the basis for a disaster-ready, high-performance distributed system. He closed by presenting some new performance analysis comparing (favorably) Beringei to Prometheus. Prometheus is an open source TSDB whose time series compression was inspired by the Gorilla VLDB paper and has similar compression behavior. Hawkular Metrics is a scalable, long-term, high-performance storage engine for metric data. The session was an overview of the project that includes the history of the project, an overview of the Hawkular ecosystem, technical details of the project, developer features and APIs and third party integrations. Hawkular Metrics is backed by Cassandra for scalability. Hawkular Metrics is used and exposed by Hawkular Services.The API uses JSON to communicate with clients. Users of Kubernetes/Heapster who want to store Docker container metrics in a long-term time series database storage, thanks to the Heapster sink for Hawkular. There are more talks today. Check out Thursday’s schedule here. Don’t forget to attend the Closing Remarks and prize give away at 4:00 pm. The last day of Percona Live 2017 is still going strong, with talks all the way until 4:00 pm (and closing remarks and a prize giveaway on the main stage then). I’m going to a few more sessions today, including one from Stephane Combaudon from Slice Technologies: Lessons learned while automating MySQL deployments in the AWS Cloud. How do you maintain an updated list of MySQL servers in the MHA configuration when servers can be automatically stopped or started? How can you coordinate your servers for them to know that they need to be configured as a master or as a replica? How do you write complex logic with Chef without being trapped with Chef’s two pass model? How can you handle clusters with different MySQL versions, or a single cluster where all members do not use the same MySQL version? How can you get reasonable backup and restore time when the dataset is over 1TB and the backups are stored on S3? This session discussed the errors Slice made, and the solutions they found while tackling MySQL automation.